Learning Hindi can certainly come in handy when traveling to India, but there are several other reasons why learning Hindi could add value to your life. First of all, almost half a billion people speak Hindi worldwide. This is not surprising when you consider that India as a nation has the largest population in the world. If you have any desire to travel to India or have some Indian neighbors down the street, then learning to speak Hindi can be a great way to communicate with some new friends. 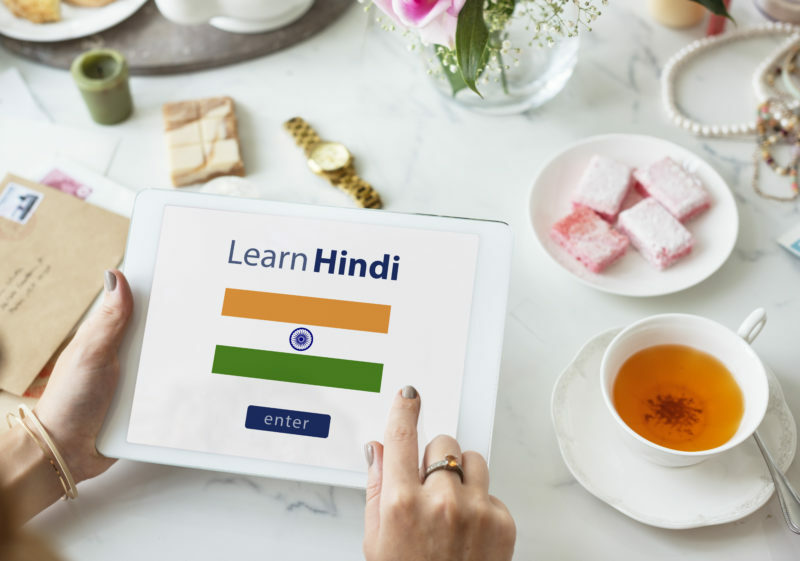 In addition to being able to speak with millions more people then you could previously, here are some more reasons why learning Hindi might be for you. 1. There are several job opportunities. Moving to India for work is becoming more popular. If you’re considering moving to India for a short time period to experience living in another country or find India to be a compelling destination to stay, then working and living in India is a great reason to learn Hindi. Even if you don’t actually want to go and work in India, the several jobs that are currently outsourced to India increases the likelihood that you may be talking regularly to Hindi-speaking people over the phone. 2. Watching Bollywood films in Hindi. Although Hollywood is well-known for producing most movies, Bollywood is not far behind. Sure, you can watch the films in subtitles. However, knowing the language of the films can reveal a much better experience for sure. Even if you’ve never watched Bollywood movies, knowing the language is a great way to fully experience the phenomena of Indian movie culture. 3. It’s a stepping stone to learning even more languages. It may sound complicated to know several languages, but in reality learning a new language gives you the tools you need to learn more. For example, you’ll find out what works best for you and how to practice learning a new language. In addition, some languages are very similar to one another. For example, Hindi is very similar to Urdu – the language of Pakistan. Therefore, by learning Hindi you can easily speak Urdu as well. It might seem like this could get confusing rather quickly, but with the right tools to help you along the way, learning a new language can be easy and fun. Of course, you can’t learn a new language overnight. Truly becoming fluent in a second language takes desire and dedication. While there are several ways to start learning a new language, FunEasyLearn is a great app to learn Hindi the fast and fun way. This app is freely downloadable from the Google Play store, and is great for those who are visual and auditory learners. The features for this app are very conducive to learning and include some of the following. The app contains over 6,000 Hindi words to provide you with the best knowledge of the language. In addition, the words have been carefully organized into 140 topics by everyday themes. Whether you’re a beginner, or simply want to refine what you already know, the FunEasyLearn app can work for you. The levels are broken down by the number of words that you can work on learning. The beginner level starts off with 1,000 words. From there, you have to master the beginner level before unlocking 2,000 more words for the Intermediate level. In a similar manner, you can advance to the highest difficulty level to unlock all of the words available on the app. In order to learn Hindi the fast and fun way requires being able to learn from your own native language. The FunEasyLearn app has several languages available to choose as your native language. This includes English, Turkish, Japanese, German, Russian, Chinese, Arabic, Ukrainian, Danish, Greek, Czech, Thai, Korean, and many more. Traveling is a great time to pick up some new phrases of a language you’re learning. It’s always annoying when you can no longer do that simply because there’s no access to an internet connection. That’s why the FunEasyLearn app is so great because you can continue you’re language learning on the go. If you already enjoy playing games for fun, translating that into learning a new language can be very helpful. FunEasyLearn has several games to help making learning Hindi a fun endeavor. This include matching games and listening and choosing games among many other fun options. If you don’t want to bombard yourself with choosing among the many games, there is also a Spin Categories feature. This allows the app to choose a topic, sub-topic, and learning game at random for you. This provides combinations you might not choose on your own. Not only can this enhance your learning of the Hindi language, it’s a fun and exciting feature. The vocabulary of words available via the FunEasyLearn app is extensive. In addition, it will also teach you several important phrases. One way the app helps you learn phrases is by having you fill in the blank to test your proficiency. You can even make your own sentences to test how advanced you have become in the language. The point is to be able to truly speak the language and not simply learn vocabulary. With over 5,000 commonly used phrases in Hindi to learn, the FunEasyLearn app will help you on your way to becoming a fluent Hindi speaker. In addition to the auditory cues to help you understand how the words should sound, the FunEasyLearn app is also visually appealing. It will allow you to visually learn throughout the process. This is great for visual learners, and also helps you to retain the information you’re learning. With FunEasyLearn only a free download away, it’s a great place to start learning Hindi. Maybe you can learn Hindi to spend some time living and working in India, or simply as a way to speak with Indian friends in their native language. Besides, speaking with people in their native tongue is a great way to enhance your own skills of the language. However, it is important to have a good starting point from which to begin such conversations. That’s where an app such as the FunEasyLearn app comes into play. See for yourself by exploring the 6,000 Hindi words that the app contains to start expanding your own language profile.